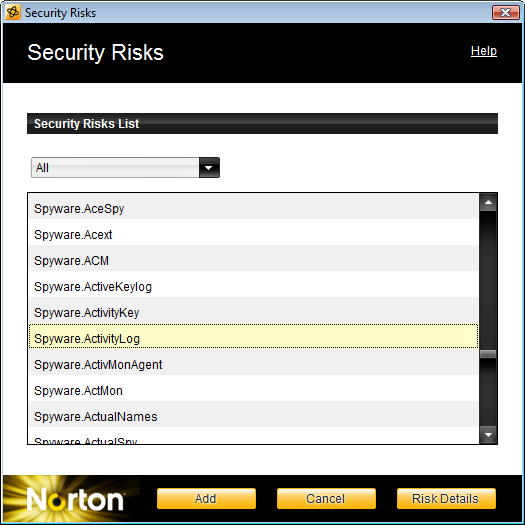 Norton Antivirus reports ActivityMon products installation is found on computer. 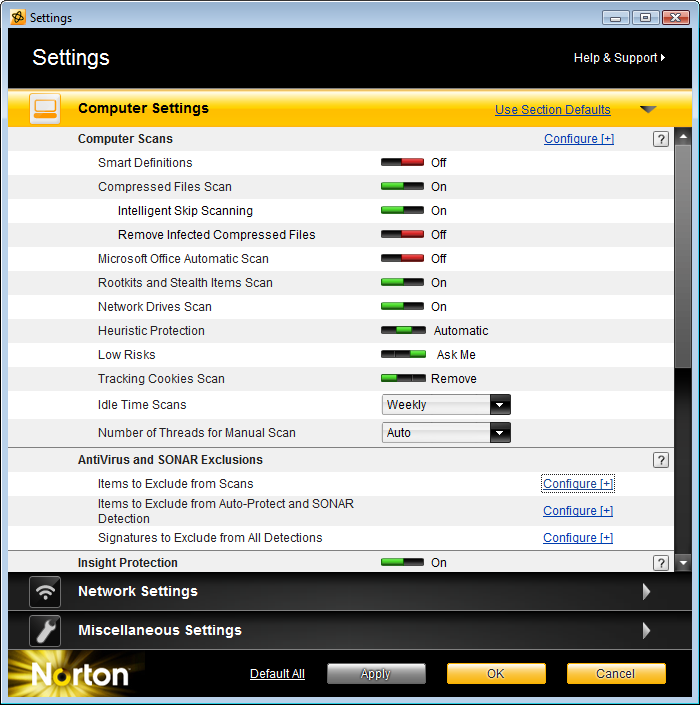 To allow seamless work of both products together on same computer it is needed to change settings of Norton Antivirus. This guide will help you to do that. First start the Norton Antivirus application: click with right mouse button over the icon on the taskbar. 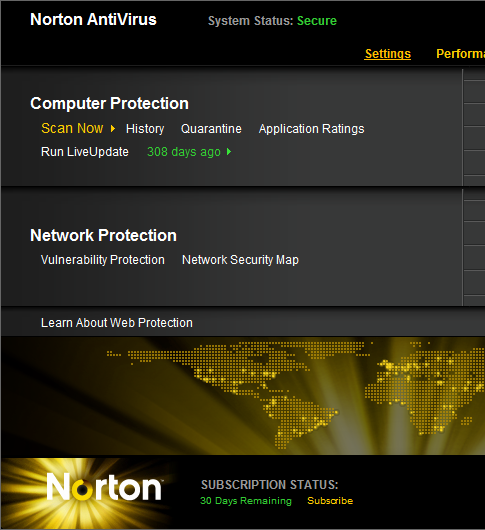 Then select Open Norton AntiVirus command. In the application window click the Settings link, see the picture. In the Settings dialog find the Computer settings category and Exclude/Scan exclusion item within. Then click on the Configure link (right to the item name). Scan Exclusions dialog is shown, click on both Add buttons in it. Enter the path you have installed ActivityMon to. This path is C:\Program Files\Advanced Software\ActivityMon by default. If ActivityMon has been installed as hidden, contact us - we will tell you the path to enter. When the path has been entered click the OK button. After the paths to be excluded from testing have been entered (see the picture) click the OK button. Another step is to exclude ActivityMon signature from testing: in the Settings dialog find the Exclude/Signature to exclude and click the Configure link right to the name of the item. 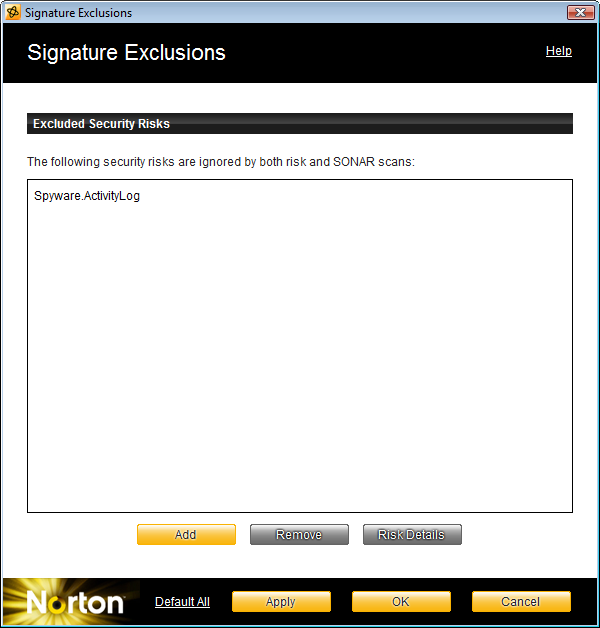 In the dialog Signature Exclusions find the Spyware.ActivityLog item, select it and click on the Add button. After the signature has been excluded from testing click the OK button and clock Settings the dialog using the OK button.